I have dabbled in light painting on and off for many years but really began focussing on it about 12 months ago. Now I must admit I am obsessed and have collected an array of tools of all shapes and sizes. 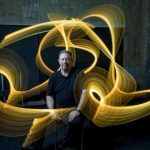 Naturally, when Fotorgear offered a review unit of Magilight – their new LED light painting stick, I jumped at the chance. At its core, the Magilight is an LED light stick comprising 144 individually addressable LED lights, and a microcomputer controller. It allows you to load images and ribbons via a TF card, which can be displayed in a variety of ways, allowing you to create all manner of light painting images. The unit comes well protected in a padded bag, and comprises of the Magilight, two “26350” lithium in rechargeable batteries, battery charger and USB cable. Putting it together is as easy as inserting the batteries, and plugging the coiled cable into the control unit. Customisable brightness, flash, flicker, colour temperature, play speed, play direction and start delay. User-friendly UI: everyone can learn it in 5 minutes. In fact I found the menu system very user friendly and easy to learn. To be honest it took me a few goes to get the timing right for my images, however, once I did, there was no looking back. You can load your own creations (Photo's, artwork, etc) onto the micro-sd card to be light-painted into your images. The user manual contains a simple set of instructions to follow, the results speak for themselves. It takes a bit of practice to hold the Magilight level when you are working on uneven ground, but again a few trial runs usually sorts things out without further issues. So, let's address the elephant in the room. How does the Magilight compare to its nearest competitor – the Pixelstick? It has less LED lights (144 v 200), but they are closer together, meaning less noticeable scan lines. It is not as long as the pixelstick. It has a variable angle handle. Selectable colour temperature, flicker and start delay. Both units have their place in light painting, don't get me wrong, it's just that I find assembling the Pixelstick in the dark tedious and at times frustrating. Give me a one-piece unit any day. The Magilight is a well thought out and engineered tool. The swivel is smooth and makes using the tool a breeze, the handle with adjustments to both angle and position along the length of the stick is a very welcome feature. The tripod mount is invaluable for those into video. For my money, it is a very worthy addition to my light painting kit. Fotorgear launched the Magilight on January 17, 2018, and it raised greater than 3 times their funding goal in just a matter of hours!